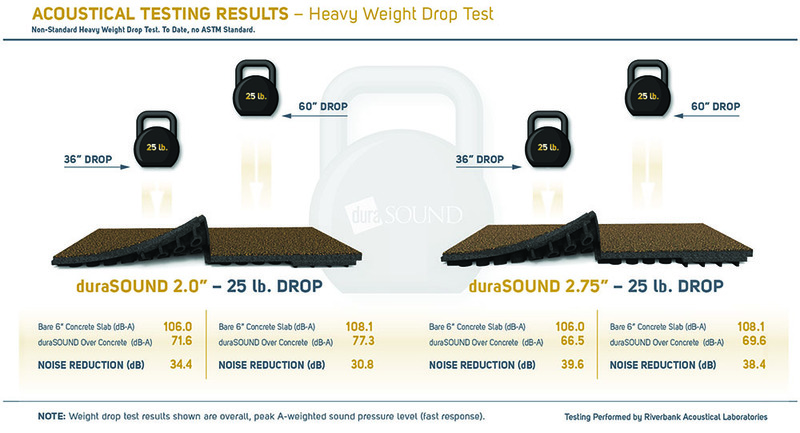 Dramatically reduce the disruptive noise and vibrations of fitness equipment with duraSOUND rubber acoustic tiles by sofSURFACES. We designed duraSOUND to dissipate energy for a better acoustical experience for both your customers and neighboring businesses. Noise is the death of countless fitness centers. The sound levels can make or break a good workout and play a role in the success or failure of adjacent businesses. With mixed-use and multifamily buildings now the norm in urban centers, the reduction of audible structure-borne sounds is essential. Understanding the design and science of sound is an essential component to any fitness center plan. For the benefit of everyone involved, in some jurisdictions, there are even acoustical control standards that ensure precautions are taken to mitigate excessive, repetitive and disruptive noise. You owe it to yourself and your neighbors to use only the best sound-mitigating surface. The most important consideration in a fitness center is being able to understand how energy travels within it. Noise can be transmitted through your building in a wide range of airborne and structure-borne methods. A good example of air-transmitted noise would be music that slips under doors during an aerobics class or the grunting of a weightlifter pushing herself further. Structure-borne noise usually occurs with the impact of a blunt force object into the floor or the vibrations of many elliptical machines. The shock and vibration energy will transfer through the rigid building structure itself and easily into neighboring spaces. Each type of noise presents a unique set of challenges. Two major sound influencers are construction material and people/equipment. You must have a holistic approach to noise mitigation and take into account the construction materials of not just your own space, but of adjoining spaces. When a weightlifter drops a dumbbell, the energy produced will travel anywhere it can. In most cases, the acoustics of a fitness center will allow the sound to travel under floor mats, through walls and beyond ceilings, disrupting those using adjoining rooms, businesses or living spaces. The effects of noise from people and equipment go far beyond weights. Circuit training, treadmills, spin classes, dance, CrossFit and aerobics all create unique challenges. 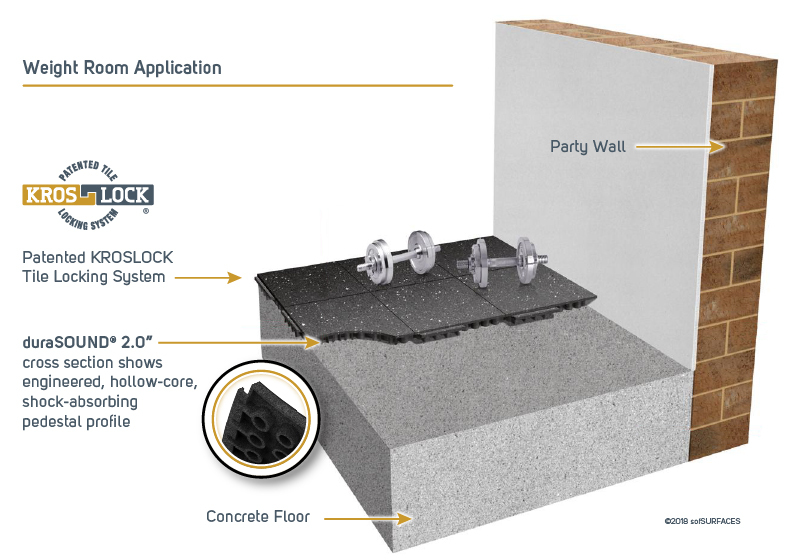 b.	a versatile construction that intercepts, absorbs and disperses vibration and sound energy. 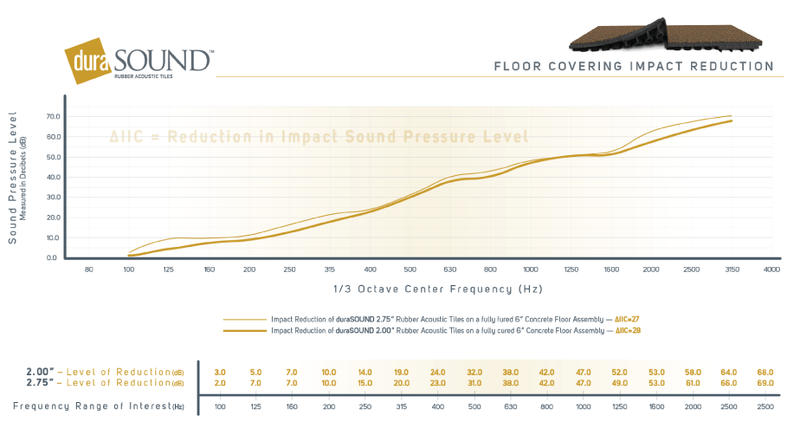 duraSOUND tiles are made with 100% recycled materials and are engineered to control vibrations, catch some air, reduce impact noise, and intercept the transmission of sound by up to 38 decibels (dB)! 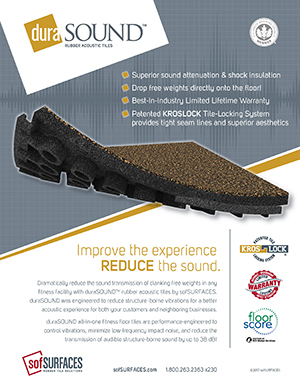 Reduce injuries with the science of duraSOUND’s rubber engineering. The surfacing greatly reduces the bounce of weights and heavy equipment that could potentially have debilitating consequences if not factored into the equation. sofSURFACES partners with a worldwide organization accredited as an ISO 17025:2005 laboratory system by the U.S. Department of Commerce, National Institute of Standards and Technology (NIST) under the National Voluntary Laboratory Accreditation Program (NVLAP Lab Code: 100227-0). •	Delta IIC (ΔIIC) This industry rating involves testing a weight assembly on concrete, then measuring the difference between concrete and the surfacing specimen over concrete. We’re constantly rated superior to the competition – just ask to review our Delta IIC ratings! International Building Code suggests ratings of 50 for STC and IIC testing. As you can see, sofSurfaces solutions are a minimum of 53 and as high as 56 over a bare 6.0 inch concrete slab (without ceiling)! In addition to these standard tests, sofSURFACES undergoes additional rigorous testing that more accurately demonstrates the real-life performance of our exclusive surfacing solutions. 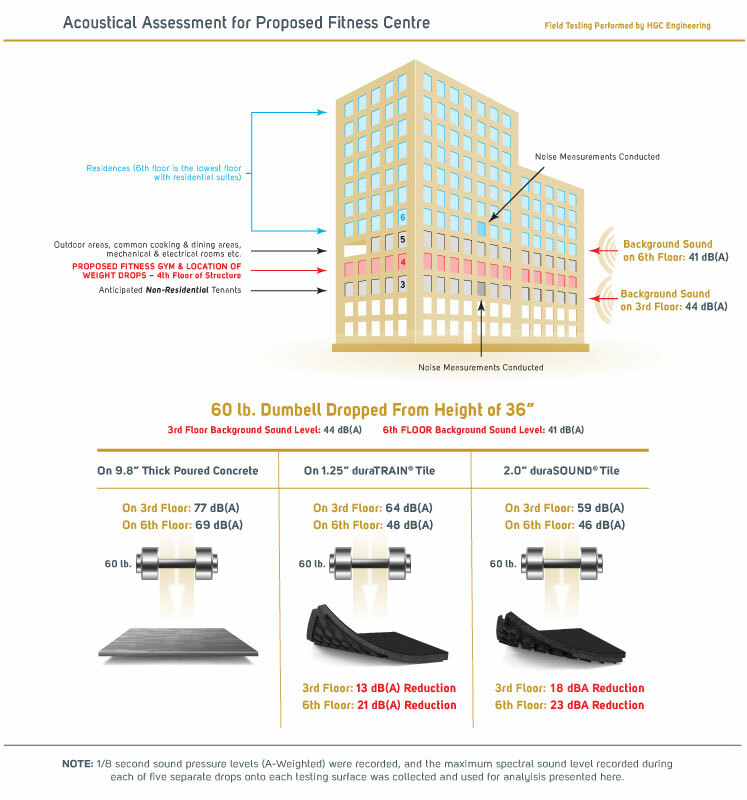 Our heavy-impact tests use 25 lb and 55 lb weights dropped at various heights to demonstrate a more realistic effect of how our product will perform within a fitness center environment. Made from 100 percent post-consumer recycled materials, duraSOUND Rubber Acoustic Tiles are available in a range of standard Plus Series colors as well as an infinite range of Hybrid Series color blends. Or, create your very own custom blend right here! center! Further, a louder gym means your customers are more likely to increase the volume within their headphones, which could contribute to long-term hearing damage. Noise reduction not only results in a more pleasing experience for customers, but can lead to healthier lives for your members. Sound Pressure Level (SPL) is specifically defined in decibels. Consider that each 3 dB increase doubles the sound energy (but this is only just noticeable to a listener). When 10 dB is added, the energy is increased ten-fold, while adding 20 dB is a hundred-fold increase. Since humans do not perceive amplitude linearly, a 10 dB reduction will sound as if the loudness was reduced by 50%. 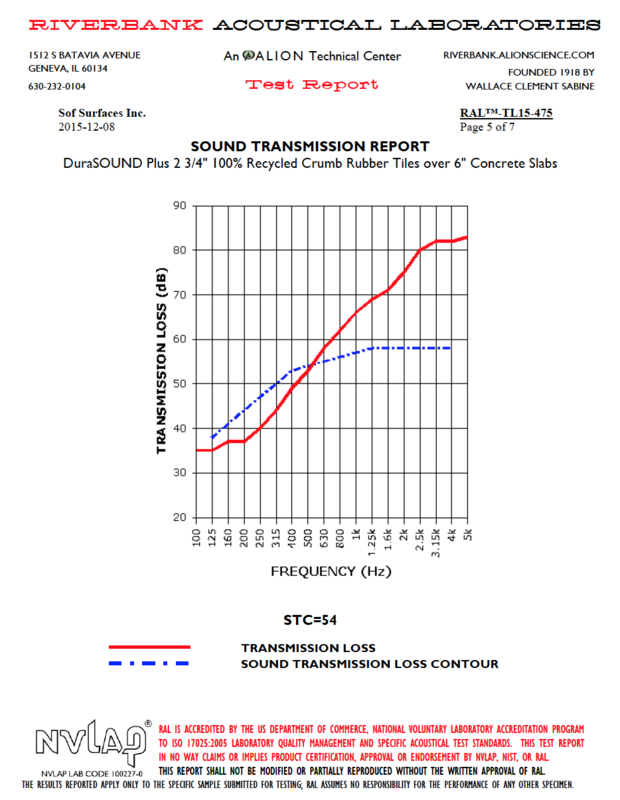 A reduction of 1 to 2 dB is considered a “slightly noticeable” difference. Understanding sounds and frequencies in a fitness center is a science – fully understanding the mess of sounds and vibrations. Fortunately, duraSOUND Rubber Acoustic Tiles have been engineered to reduce all noises. We manufacture sofSURFACES surfacing solutions to better than the industry standard in every category, resulting in practically silent applications.